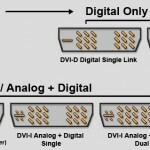 DVI De-Mystified – Dual-Link DVI versus Single-Link DVI Explained! Today I was doing some spec hunting for my PC, trying to track down exactly what make, model and frequency were supported by the Wi-Fi card that came with my machine. As I was doing so, and eyeballing the rest of the specs, I ran across the information for my video card. One thing that caught my eye was the description of the video or DVI port. Specifically it mentioned that the DVI port was a ‘dual-link’ DVI port. 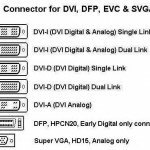 Well now, I consider myself pretty knowledgeable about computers, including hardware, but I hadn’t heard of a ‘dual-link’ DVI port before. Now, in my defense, I have spent the last many years concentrating on hardware by Sun, Hitachi, NetApp and the like. Things you will find in a full up data center, not at home in your desktop PC. I haven’t been knee deep in PC tech for a while, but I have kept up with most things. So, naturally, I had to find out what ‘dual-link’ meant. I did some searching and found a wonderful article that explains what ‘dual-link’ is, what ‘single-link’ is, the differences between them and more. I am going to give you a brief summary (I don’t want to keep everyone in suspense), but I am also including a link to the original article, go read it and really get learned up. 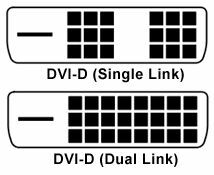 Now, for the sake of completeness, even though this doesn’t really apply to the dual-link or single-link question, I wanted to include another image or two that show other versions of the DVI plug. Since you are likely to run into one or all of these plugs out there somewhere, I figured you might want to know what you are looking at. 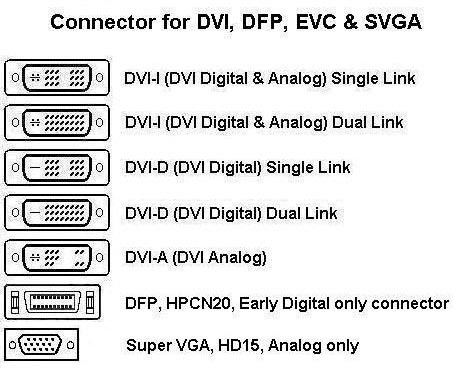 These two pictures (click to enlarge), show you that aside from the digital DVI-D plugs, there are also DVI-I plugs that are analog and digital, plus some other older plugs. Of these older plugs, the Super-VGA there on the bottom is very common and one that you probably will see a lot. It was used for many years before the DVI option became common. I have seen many video cards that have DVI and VGA on the same card. 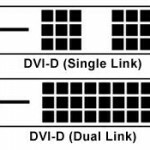 Check out the article on DVI dual-link versus single-link here.